KATIE: Waffles, you may like flying high, but I'm going to keep my paws firmly on the ground. 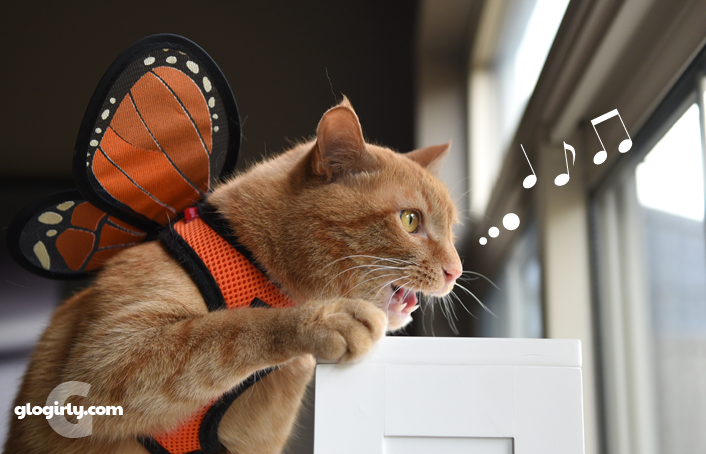 Besides, everyone knows the song is, "DOG and Butterfly." WAFFLES: Well that's dumb. Everyone knows dogs don't fly. KATIE: Yeah well, cats don't either. WAFFLES: That's not true either, Boss. KATIE: Waffles, enough with the ear worms already. WAFFLES: I bet I can fly from my cat tree all the way up to that window. Want to see? KATIE: You mean the window above our drinking fountain? That didn't work out too well for you the other day. KATIE: Yeah, I don't think you've got enough wind beneath those wings of yours. WAFFLES: But Boss, I thought you were the wind beneath my wings. 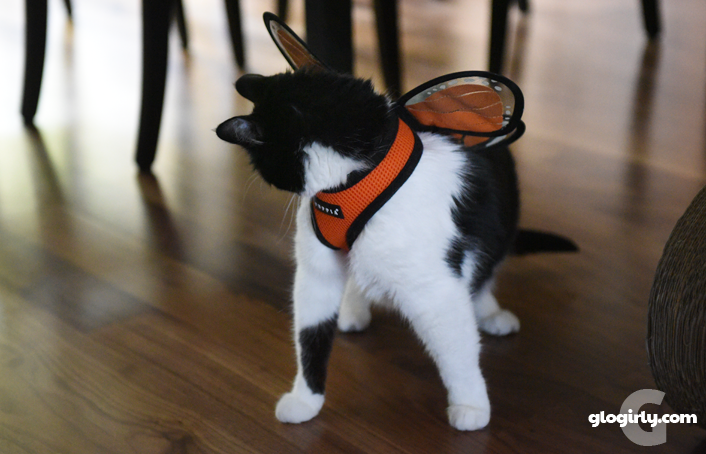 Today's photos are from the fall of 2015 shortly after Waffles got his new orange harness. 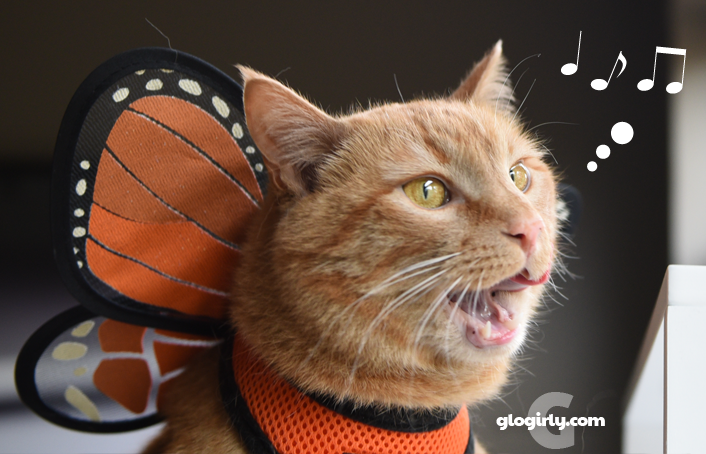 When Glogirly saw the orange butterfly wings at the store, all her common sense flew out that tall window Waffles likes so much and she brought them home. 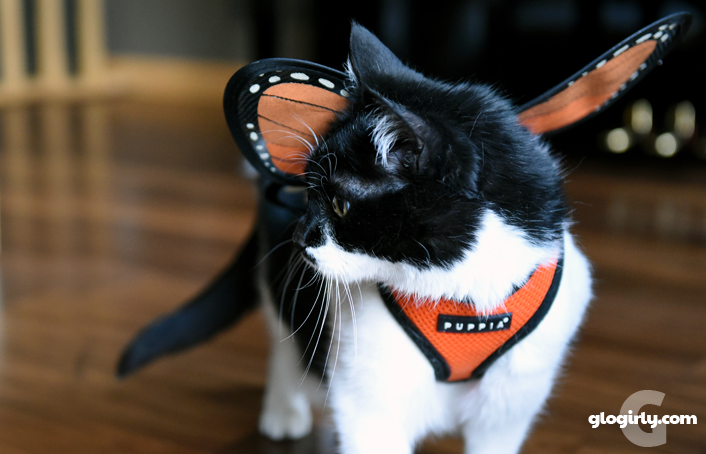 We're not big on costumes and clothing, but both Katie and Waffles do great in their Puppia Harnesses. Although they're made for dogs, the small is a perfect fit for each of them and fits comfortably and securely. So when Glogirly gets that crazy urge to add a little something-something to Katie & Waffles' wardrobe, she tries to limit the accessories to small add-ons that can be easily attached to a harness. A simple bow tie, crocheted flower, patch or in this case... a pair of butterfly wings. Of course Katie and Waffles, like most cats, love the au naturale look best. 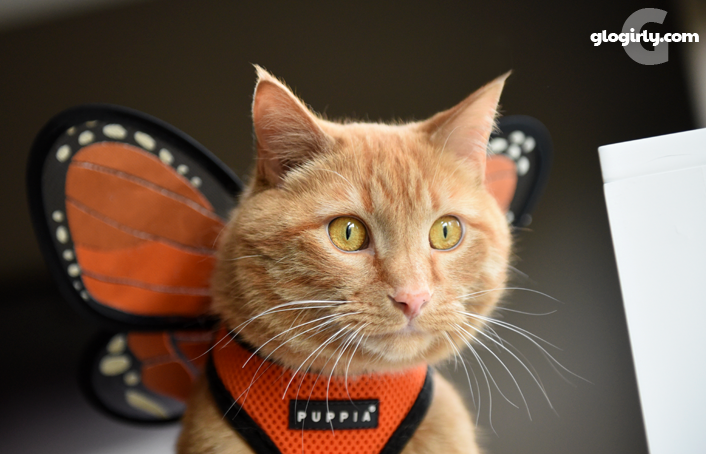 But if you're up for an adventure outside the house, perhaps a little walkabout in the grass or a shopping trip to your local pet food store, a harness and leash is a must. commission to support Waffles' chicken habit when you make a purchase. And Katie always that look that says, "For real, Waffles? FOR ... REAL?" Poor Wafflesly- he was so confident and sure until the end when Katie sucked the air right out of his plans. Love you Waffles! They look very cute in their attire. In the first picture of Katie she looks slightly distressed as if to say, "There's something on my back! What's on my back? WAFFLES?! GET OFF MY BACK!" Hahaha. I have always admired thse harnesses, they look so smart and secure when Waffles and Katie wear them! 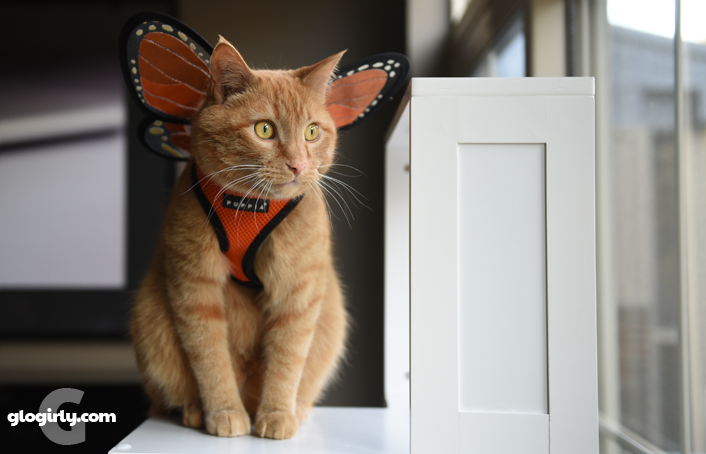 Fortunately, my human never ran across those butterfly wings! Weird thing about my pink Puppia harness - I can bolt out of it if startled, but it fits Binga perfectly! My human thinks it's because my head is exceptionally small (like her head! She can probably wear children's hats). Binga does NOT have a small head (that's all I'm saying...) so she's kind of inherited it for good. We love the wings! Waffles is sooooo silly! But keep on believing! So what exactly happened in the window above the water fountain? Inquiring cats want to know, Waffles! Soooo funny! 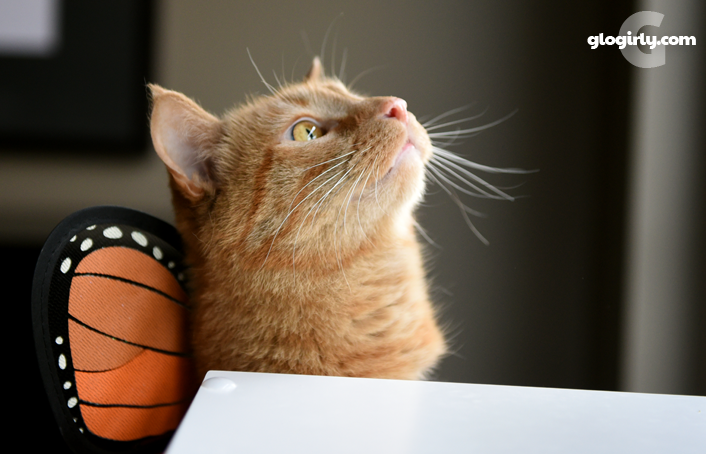 I have a cat that likes to fly, but coming down is a bit more like a flying squirrel than a butterfly! Land lightly Waffles. You two look so awesome! I'm not sure about dogs flying, either, but Siberian Huskies sure can -- you should see Cam and me rip across the yard!!! WHEEEEEEEE!!!!!!! I love those faces, one oh so confused and the other sure he's up to no good. Just like at our house. What is it about orange kitties and the confused look? If this isn't the most darn tootin' cutin' harness, then I don't know what is! 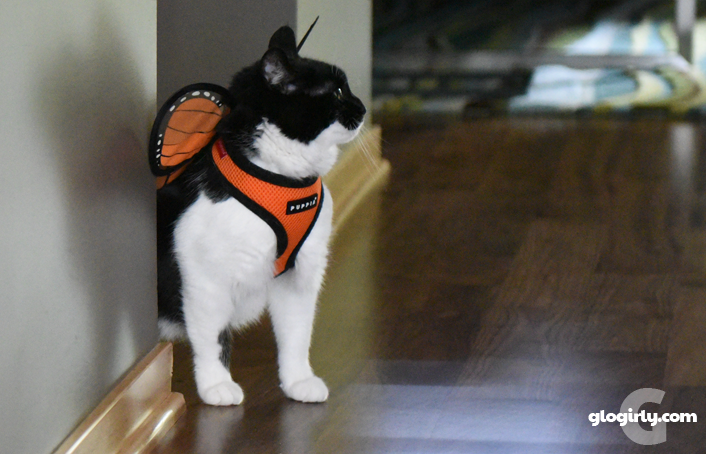 i think you should have a contest and give a way a harness with wings! Frodo would love one!